You can use macros in Excel 2010 to save time by automating tasks that you perform frequently. A macro is a series of commands grouped together that you can run whenever you need to perform the task. Although you can write your own complex macros in the Visual Basic programming language, the easiest method for creating many macros is to use the macro recorder. When you record a macro, Excel stores information about each step you take as you perform a series of commands. You then run the macro to repeat, or play back, the commands. The macro recorder records every action you complete. Therefore, planning your macro before you begin the recording process is very important so you don’t record unnecessary steps. Click Customize Ribbon in the left pane, and then select the Developer check box under Main Tabs on the right side of the dialog box. The Developer tab appears in the Ribbon. Display the Developer tab to work with macros in Excel 2010. Choose Record Macro in the Code group of the Developer tab. Type a name for the macro in the Macro Name text box. The first character of the macro name must be a letter, and the name cannot contain spaces or cell references. Macro names are not case-sensitive. (Optional) Assign a Shortcut Key. If you select a shortcut key already used in Excel, the macro shortcut key overrides the Excel shortcut key while the workbook that contains the macro is open. This Workbook: Save the macro in the current workbook file. New Workbook: Create macros that you can run in any new workbooks created during the current Excel session. Personal Macro Workbook: Choose this option if you want the macro to be available whenever you use Excel, regardless of which worksheet you’re using. (Optional) Type a description of the macro in the Description text box. 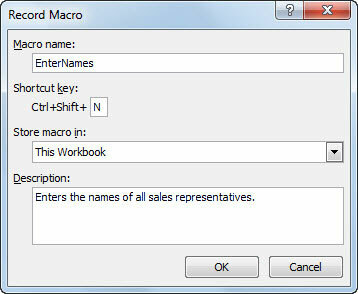 Use the Record Macro dialog box to begin creating a macro. The Record Macro option on the Developer tab changes to Stop Recording. Perform the actions you want to record. Excel records your steps exactly — such as (Select cell C3) — but you can also record the steps relative to any current cell — such as (Go up one row and insert a blank line). To do so, click the Use Relative References button on the Developer tab. You can turn the Use Relative References feature on and off as needed when recording the macro. Choose Stop Recording in the Code group of the Developer tab. The macro recorder stops recording keystrokes and the macro is complete.